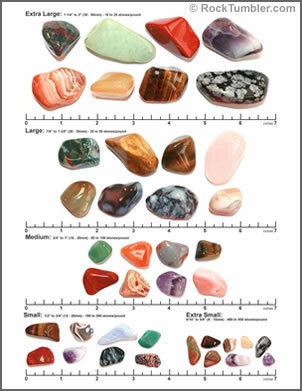 Tumbled Stones: Printable size chart for our stone mixtures. Our printable tumbled stone size chart illustrates the size of the stones in our tumbled stone mixtures. When printed, it shows the size of extra large, large, medium, small and extra small stones at close to their actual dimensions. We sell tumbled stone mixtures in five different sizes: extra large, large, medium, small and extra small. We also sell single-variety packages of tumbled stones. These are mostly medium size, but a few stone varieties are non-standard sizes. How Big Are Our Tumbled Stones? To help you understand the size of our tumbled stones before you make a purchase we have created a printable size guide. It illustrates stone sizes at close to their actual dimensions. We believe that it will print from your computer at close to the correct scale. If you want to confirm that, simply get a ruler and compare it to the measurement scale on our document. We encourage all of our customers to print this chart. It will help you feel comfortable in selecting the proper size stones for your project. Thank you! How Are the Stones Measured? The stone sizes that we sell are summarized in the table below. This table lists: A) the name of the size; B) the approximate range of stone dimensions for that size (in inches); and, C) the approximate number of stones per pound. This data applies to the tumbled stone mixtures that we sell on our main mixtures page and on our bulk pricing page. 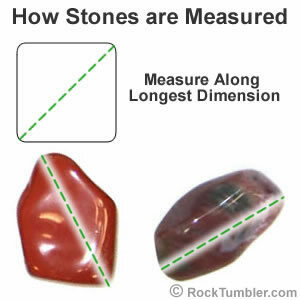 This image shows how to measure the maximum dimension of a stone. How Many Stones Per Pound? The size table above lists the approximate number of stones that should be contained in one pound of our tumbled stone mixtures. (This information is also on the printable size chart and the pages where they are sold.) For example, packages of medium size usually contain about 75 to 110 stones per pound. These numbers will vary depending upon the size of the stones and upon their specific gravity. If you are purchasing the single variety stone packages, a few types of stones have a higher-than-average or lower-than-average specific gravity. That means they are heavier or lighter than the typical stone of similar size. For example, dumortierite will have about 50 to 90 stones per pound, fluorite 60 to 90, hematite 35 to 55, hypersthene 55 to 80, jet 60 to 80, rhodonite 55 to 85, etc. Please read the stone description to know how many stones per pound you are likely to receive. We update our website with our best estimates each time we receive new stock from our suppliers. All of the stones that we sell are size-sorted by screening. For that reason you will find some oversized and some undersized stones in any bag that you purchase. However, most of the stones should be within the specified size range. Occasionally, you might find an exceptionally long stone that slipped through the openings of the screen. Above you can see what sizing stones with a screen would be like. All of these stones were pulled from our extra large inventory. Note: In the photo on the left, you can see 5 elongate stones on top of the screen near the bottom of the photo. In the photo on the right I took those stones and put them in an orientation in which they could fit through the screen. Those stones are now considered to be the next size smaller. A similar thing could happen where smaller stones end up sitting on top of the larger stones never falling through the screen. This is why you should expect some stones to be outside of the stated range. Stones that are medium size and larger receive a quick visual inspection on one side and any defective or damaged stones that we notice are removed before packaging. The labor required to inspect every stone from every angle would greatly increase your cost. For that reason you will probably find a few damaged stones. The small and extra small sizes are not inspected. You will have some broken and chipped pieces in these smaller sizes especially in the extra small. If we hand inspected every piece the price we charge would triple or quadruple due to the labor required. If you are uncertain about what size to purchase we recommend purchasing a small, one pound or three pound package to become familiar with the stones. If the size does not suit your needs it is a lot easier and less costly for you to return a small package than it is to return forty pounds of stones. If the stones that you receive are not suitable for your intended use, they can be returned for a refund of the purchase price if they are still in their original bag and the bag is unopened. Shipping and handling fees are not refunded or reimbursed if the stones are "as described" on our website and in conformance with what we have described on this page. How many and what different varieties of stones you should expect to find in your package vairies depending on stone size and package size. You can expect to find between eight and sixteen different varieties in a package. Why so few? These are natural materials being mined from the earth, usually from small deposits. When a deposit is mined out, that material may not be available again until another deposit discovered. For these reasons you should not expect two packages, even if they are purchased at the same time, to contain the same varieties. * If you purchase a 1-pound package... you may not receive the number of varieties mentioned above for a 3-pound package. ** Many varieties of tumbled stones have features that are larger than what can be observed in small and extra small stones which can make them hard to identify with confidence. The stone varieties that might be found in our tumbled stone mixtures include apricot agate, banded amethyst, banded carnelian, blue lace agate, Botswana agate, brecciated jasper, carnelian agate, crystal quartz, dumortierite, green aventurine, moss agate, hematite, leopard skin, lilac amethyst, picture jasper, pink Botswana agate, red jasper, rose quartz, snowflake obsidian, tiger eye, tree agate, turritella agate, unakite, yellow jasper, zebra marble, yellow quartz and other common materials. You should not expect to find high value or rarer varieties in these mixtures. We do not offer this service and below are some of the reasons why. 1) If we handpicked stones of specific sizes, shapes or colors for the customer before you then you would not receive a nice variety of stones in your order. We must decline picking special stones to preserve the quality of the mixtures for all customers. 2) Hand picking requires a lot of labor. We must decline hand-picking stone requests even if you offer to pay extra. 3) What we pick as high quality attractive pieces may be different than what the customer would pick themselves. If you need particular stones you should purchase individual varieties of tumbled stones. If those don't work for you it would be best to go to a rock shop or souvenir shop and pick the stones yourself. You will get to see, handle and inspect every stone before you purchase it. We have an article titled "Uses of Tumbled Stones" that shows a few of the many ways that tumbled stones are used. Some of these examples were submitted by our customers and some by our staff. Small and extra small stones are often used in craft projects. Medium stones are the most popular and are used in jewelry, vases, games, potted plants and much more. The larger stones are popular as "giveaways", lucky stones, accents in planters, meditation stones and much more. You will probably think of even more ideas for your stones.